Harrisburg (June 5, 2018) -- The men and women who are building Pennsylvania’s natural gas energy infrastructure are taking their stories to elected officials in Harrisburg with a series of digital and radio ads in support of lobbying efforts. The Mid-Atlantic Laborers-Employers Cooperation and Education Trust, an affiliate of LIUNA – the Laborers’ International Union of North America – is funding the outreach effort. The ads are scheduled to run through the June session of the General Assembly. The rank-and-file workers participating in the ad effort are from across the state, including Pittsburgh, Wind Ridge, Chester, Plains and Kulpmont. The ads will run as videos and banners on digital and social media in 10 state Representative districts and 12 state Senate districts, as well as in metro Harrisburg. In addition, the workers will be featured in radio ads airing on Harrisburg’s top two stations. Leaders – from former President Obama to the Environmental Defense Fund to the Union of Concerned Scientists – consider natural gas to be the ideal bridge fuel to a no-carbon future. In fact, clean natural gas accounts for recent reductions in U.S. carbon emissions, according to the U.S. Energy Information Administration. In addition to being cleaner fuel, natural gas infrastructure creates thousands of good jobs. According to a study by ICF International, a global consulting and technology services firm, the natural gas industry is connected to 178,100 jobs in Pennsylvania, or 3.1 percent of all jobs in the state. Their report also determined that natural gas infrastructure contributed about $8.16 billion in economic activity in the state in 2015, the year studied. When done right – with highly-trained, skilled union workers – natural gas pipelines are the safest and most efficient way to transport the fuel. LIUNA’s training programs have already provided nearly 10,000 hours of pipeline safety instruction to workers in the state. Cheaper natural gas has also helped Pennsylvania residents keep the lights on. According to a University of Pennsylvania report, 79,000 fewer state residents in 2016 received shut-off notices due to use of Marcellus Shale natural gas. 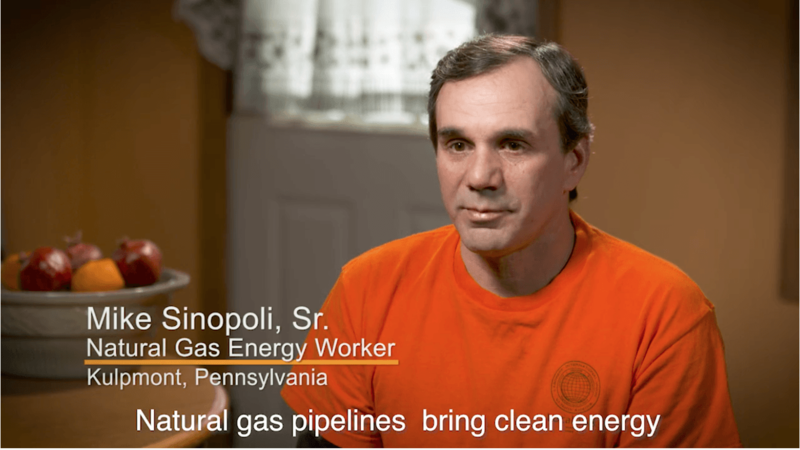 Each of the radio and video ads feature a Pennsylvania natural gas workers’ personal perspective. Martire said the union will continue to feature the stories of natural gas workers in Pennsylvania and other states in the region. The ads can be seen and heard at CleanNaturalGas.org.